NovaSlim font family series mainly provide Regular and other font styles. Nova Slim font family series mainly provide Book and other font styles. Komika - Slim font family series mainly provide Slim,Slim-Italic and other font styles. 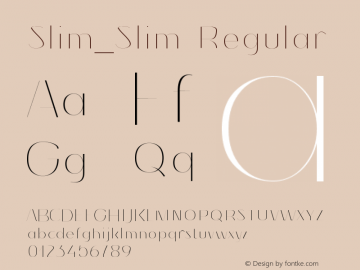 Slim_Slim font family series mainly provide Regular and other font styles. Arcade Slim font family series mainly provide Slim-Normal and other font styles. Mister Sinatra Slim font family series mainly provide Slim and other font styles. Fewt font family series mainly provide Bold,Bold Italic,Slim,Slim Italic and other font styles. SLIM font family series mainly provide Regular and other font styles. TX slim font family series mainly provide Regular and other font styles.